Aditya Birla Chemicals, BASE SE, Nippon Light Metal Co, and Gulbrandsen were the dominant names in the global anhydrous aluminum chloride market for 2015. However, these companies held a meagre 18.8% in the market in 2015 revealing a highly competitive and fragmented scenario with the presence of small and medium-sized players. As a result, leading players in the market are vying for consolidation along with product development in order to serve the changing lifestyles in present times and to serve a large number of industries. 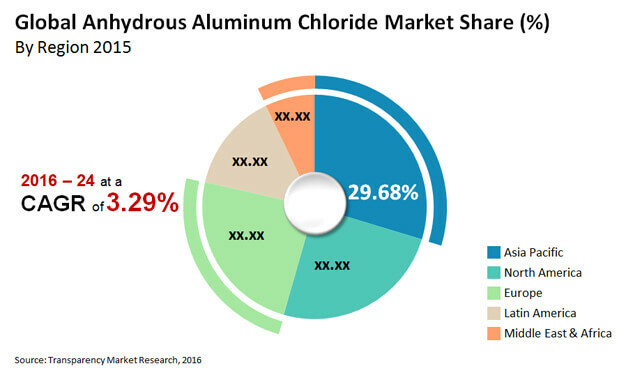 According to a new research report by Transparency Market Research, the worldwide market for anhydrous aluminum chloride is expected to display a high degree of competition in the coming years. This is mainly due to the presence of a substantial number of players that are established at global or regional level. Moreover, the easy entry of new players into the market due to low initial capital is augmenting the degree of competition in the market, says the lead author of the study. However, strict regulations in place that govern the anhydrous aluminum chloride industry are challenging the growth of small players as well as the overall market. The global market for anhydrous aluminum chloride is estimated to be worth US$0.91 bn by 2024 increasing from US$0.70 bn in 2016 at 3.3% CAGR between 2016 and 2024 in terms of revenue. By volume, the market is projected to rise at a 2.90% CAGR between 2016 and 2024. At present, China, India and other nations of Asia Pacific that are displaying intense economic growth are extending tremendous growth opportunities for the growth of the anhydrous aluminum chloride market. The flourishing apparel, automotive, and construction industries is indirectly benefitting the global anhydrous aluminum chloride market due to the production of dyes and chemical pigments. Moreover, top players that are based in North America and Europe are strategizing to take up a share in the expanding Asia Pacific market. The thriving pharmaceutical industry of China and India are expected to extend immense growth opportunities for this market in the coming years. Although the aforementioned factors are perceived to bode well for the growth of the global anhydrous aluminum chloride, they are largely applicable to the Asia Pacific market. The demand for anhydrous aluminum chloride is relatively low in the Middle East and Africa and Europe in comparison to North America and Asia Pacific. By application, the anhydrous aluminum chloride market is segmented into dyestuff and pigments, pharmaceuticals, flavors and fragrances, hydrocarbon resins, and fumed alumina. Dyestuff and pigments is the leading application segment due to the broad spectrum use of anhydrous aluminum chloride in the production of common dyes and ethyl benzene. Anhydrous aluminum chloride is extensively used as a catalyst in the dyestuff industry for the production of pigments and for obtaining the derivatives of anthraquinone. In terms of volume, dyestuff and pigments held a share of more than 24% in the global market in 2015. The steady and sure-shot demand for dyestuff and pigments is the leading factor driving the growth of the market for anhydrous aluminum chloride across the world. The rising application scope of anhydrous aluminum chloride growth for consumer goods, pharmaceuticals, and beauty products especially cosmetics is also driving the market. While the usability of anhydrous aluminum chloride is unparalleled across several applications, its negative effects on the environment as well as on humans are concerning. Inhalation or ingestion of anhydrous aluminum chloride can be harmful due to its chemical composition.